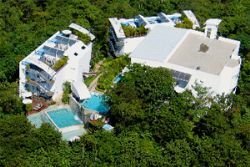 Gaia Hotel and Reserve is located in Manuel Antonio, Costa Rica, and sits on a vast tract of lowland coastal forest, teeming with spectacular and rare wildlife. Gaia is an adults only luxury boutique beach 5 star hotel and resort that offers sublime luxury in a spectacularly exotic locale. Gaia offers more conveniences than the guest could need, including an on-site restaurant, room service 24/7, spa, gym, and pool, plus the availability of a myriad of personal services. Gaia presents to the guest all that is desirable in an eco-friendly environment.